Hello and welcome to the Easel Card Blog Hop! If you’ve hopped here from Jenny’s blog – you are on the right track. Otherwise, so you don’t miss any fun, you can start back at the beginning with Ashley’s blog. If you have never tried making on of these cards before – you should really try! They are fun to make and can serve many purposes. I’ll show you how! 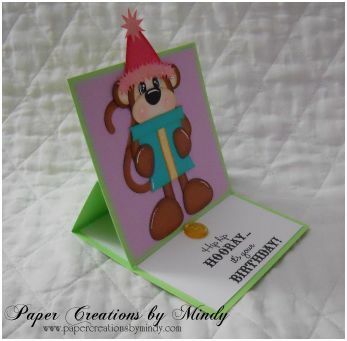 First, here is a link to the directions how to make easel cards. Click HERE. We have a busy month of birthdays for August and I will definitely be in need of some cards. Then when you pop it up – the button keeps it in place like a built in stand. 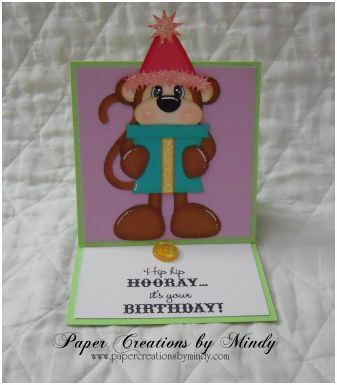 The monkey on the cover was created by an svg file called Birthday Monkeys from Little Scraps of Heaven Designs of which I am a proud design team member for. Another great idea is change up your measurements and make you cover a 4″ x 6″ or 5″ x 7″ . Then put a picture on the cover. Works great for Christmas cards and instead of hanging it from the wall or on the fridge, it can display nicely on your table for the season. Another thought is putting your child’s school picture on there! Endless possibilities! Hope you enjoyed my project and ideas! Be sure to hop on over to Jessica’s blog for her fantastic project! If you get lost along the way here is the entire lineup. So sweet of you to give ALL the different ideas on ways to create the easel card. Yours is super cute and the expression on the monkey is darling.Happy to have shared such a great hop with you girls. Creative Wishes & please don't forget to come help me celebrate my 1st year and win a FREE gift card! This is so adorable! Love the sweet monkey! I love this card. Your SVG is too sweet. 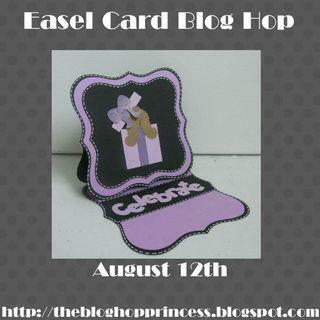 I am learning so much about easel cards, what a GREAT idea for a hop! very cute!! love that monkey!! Mindy…this is soooo adorable!Very Sweet!Lovely!I really enjoyed your card! Super adorable monkey. Great job. This is so sweet! Love the monkey and the sentiment is perfect! TFS New follower! Super cute card. Your sentiment is great. Cute card!! I'm a new follower! 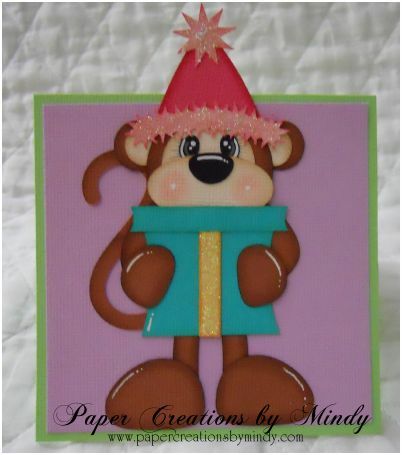 Super cute card, the monkey is adorable. What a super cute monkey! So glad to be in the hop with you! oh my gosh that monkey is the cutest!! such a cute card! Very cute card! I was a pleasure being in the hop with you! AWWWW!! This is so super sweet!!! I LOVE that cute little guy and the white highlights. Mindy! LOVE LOVE LOVE your ideas on what to use these cards for!! I will have to try the photo one for christmas! Our friends and Fam will <3 them!! Great ideas! What a cute little Bday Bear. I love his feets! Yes, to answer your question for your FB followers, love your posts. Thanks for sharing on this fun hop with a new blog visitor and follower.